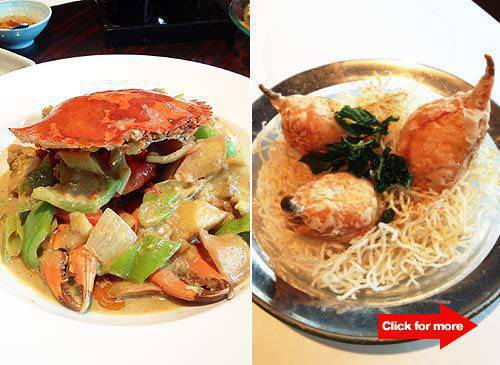 Try out Hyatt’s crab dishes this June. Crab fest! Click for more. (SPOT.ph) This month, Li Li at Hyatt Hotel and Casino is serving up a crustacean feast starring the sweet and succulent Blue Swimmer Crab. Specially crafted by by Lili’s Chef de Cuisine Andy Chan, the Season of Crab menu features seven dishes ranging from appetizers to entrees. Start off with the Deep-fried Crab Claw (P280/per piece), a plump, bite-sized hors d’oeuvre of crab meat in batter, made extra-luscious with a complementing shrimp mousse sauce. The stir-fried smooth egg white and crab meat with cream sauce (P620) packs sumptuous flavors and the crispy fried wanton chips on the side add a nice contrast to the creamy concoction. 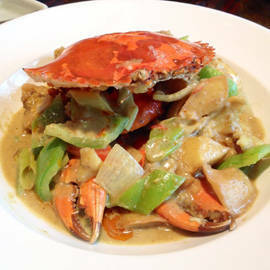 For some punch, try the spicy Thai-style pan-fried crab (market price), its green curry paste leaves a pleasant amount of fire on the palate. While you’re at Li Li, make sure to take advantage of their unlimited dim sum buffet (P725+ per person). We recommend the Har Gao (hakao) or steamed shrimp dumpling, the crunchy Taro Dumplings with Assorted Seafood, and the savory Steamed Dumplings with Pork, Eggplant, and Peanut Chili. Finally, sate your sweet tooth with Li Li's White Chocolate Masachi, a mochi-like, peanut-coated dessert with white chocolate filling. Li Li’s Season of the Crab menu is available until the end of June. For reservations, contact Li Li at 247-8663 or 245-1234 ext. 7251. Photos above courtesy of Sasha Lim Uy.